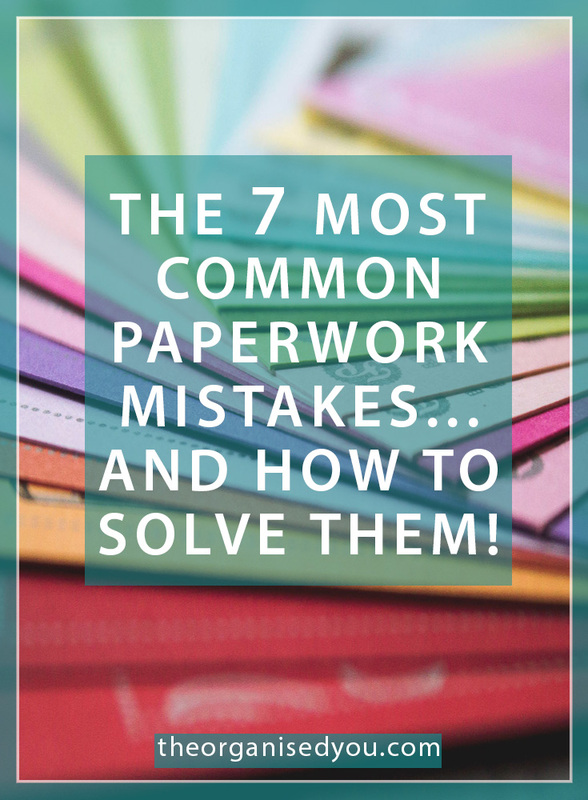 The 7 most common paperwork mistakes... and how to solve them! Today I want you to take ACTION. Action = progress, and whether you realise you're making mistakes with your paperwork or not, taking action is going to make a huge difference to the way you run your household, and stay on top of your paperwork. As you read through each of the 7 most common paperwork mistakes, I want you to really think about whether it's something you're currently doing, or that is currently happening, in your home. If you can relate to any of the scenarios, I want you to take action today to try and fix it - schedule it in your calendar, make an adjustment, start sorting, ask for help. You can also get your free checklist within this post of what you should be keeping, and what you can safely get rid of to help you with your paper purging journey. Are you ready, action-taker?! If you had a look around your home mid-week (when the clutter has had a chance to accumulate), how many piles of paper would you discover? Flat surfaces of the home are notorious for turning into a dumping ground for all different types of paper. But one reason this can happen is because you have TOO MUCH paper coming into your house in the first place. Oftentimes, we have more paper entering our home than is actually necessary. My post on your first step to tackling paper piles looked at strategies for assessing which types of paper are accumulating in your home. There are so many different types of paperwork in our lives - it can blow your mind when you actually take notice! The solution? One of the best ways to reduce excess paper in your home, is to brainstorm all the different ways you could prevent it entering your home in the first place. Do a quick sort through of your mail while standing at the letterbox or on your walk to the front door. Put any unwanted catalogues, newspapers, magazines or ads straight into the paper recycle bin, so they don’t even stand a chance of cluttering your home! Sign up for online bills and statements where possible. Record bill payment dates on your calendar, and add a payment reminder to your phone. Cancel magazine or newspaper subscriptions that you rarely get around to reading, or switch to the digital version. BONUS: Unsure about which paperwork you should be keeping, and which paperwork you can safely get rid of? Get your free detailed checklist by clicking on the button below, and you'll be able to purge excess paperwork with confidence! Not having a designated place to sort and store your incoming paperwork will result in those paper piles building in more spots than you care to admit. Any flat surface of your home can all too easily become a dumping ground. Whether it's the kitchen countertops, kitchen table, entryway, office desk or drawers, your dresser or nightstand… there are so many opportunities for paper clutter to build if you don’t have a central spot to store it. The solution? For now, put one box or basket in a main traffic area of your home (entryway/ kitchen/ living area) to collect daily papers. Then make it your mission to start investigating some great Daily Paperwork Management Systems that you could set up in your own home (try my Pinterest paperwork board for ideas). A command centre is a great way to keep everything organised and contained in one central spot. Find out more on the related post below! I know the last thing you feel like doing when you walk in the door at the end of a busy day is a paper sort! But avoiding this quick 5-minute step could be the one factor that’s causing all that paper clutter, stress and anxiety over missing forms or uncompleted tasks, and a genuine hatred of paperwork. Grumbling about it, avoiding it, and letting your paper-related tasks build up will not solve the problem. It truly doesn’t have to be that much of a headache! The solution? Get into the habit of opening mail, reading daily papers and doing a DAILY sort. Now, I’m not saying you have to complete every paper-related task every day, but you do need to sort it on a daily basis into Action Categories. As an example, you might label some file folders or a divided inbox with the following categories: ‘Forms to Fill Out’, ‘Bills to Pay’, ‘Move to its Home’ and ‘Kids' Artwork & Projects’. Take a few minutes each day to slot the daily papers into corresponding files, then designate one day of the week to deal with all paper-related tasks. You’ll immediately feel more on top of things! That DAILY sort is absolutely an essential step in feeling more in control of your paperwork.. However, this can become a problem for several reasons. Maybe the document has not been placed within an organised filing system, or your filing categories are too broad, or there is just too much paper to wade through. The solution? It all comes down to having better systems in place for the paperwork you DO need to keep. But knowing which papers are safe to get rid of, and knowing how long you need to hold onto certain documents is also important..
Today’s freebie shows you exactly that! Get your copy on the button below, and you'll feel more confident about your ongoing paper purging and filing. By now you might be sick of me harping on about paperwork systems! You’re thinking that you're doing perfectly fine with an in-tray for daily paper, your filing cabinet for storing important documents, and large boxes for storing kids’ artwork. And believe me, that is a fantastic start! But sometimes, those pesky papers can get out of control because your systems are just too simple, meaning you’re either holding onto everything ’just in case’, or getting rid of things that you will actually need to refer to down the track. An in-tray can act like a flat surface - the papers aren’t sorted, and you don’t know exactly what actions you have to take to process them. A filing cabinet can turn into a spot to shove papers to be ‘dealt with later’ if not set up in an organised way. Systems need to have a few more moving parts in order to be really effective and save you time in the long run. The solution? Knowing your next action for the ‘active papers’ - that paperwork that you actually need to do something with - is so important. Whether it’s a call to be made, a bill to be paid by a certain date, a form to be signed, an RSVP to be replied to... Knowing what your next step is means you can deal with the task at hand, then either shred, recycle or file away the information. On the flip-side, your paperwork systems might be too complicated! You might have too many steps for sorting or actioning; too many supplies or materials within a certain system; a filing system with too many categories or labels; your family members can’t follow the system so it all ends up on your shoulders; or a system that you dread using because it’s just too time-consuming and inefficient! The solution? If you can relate to any of the above statements, then you know you need to make some adjustments. Research different paperwork systems that might make your life easier, and your time more efficient and productive (check out my Pinterest Paperwork board here). 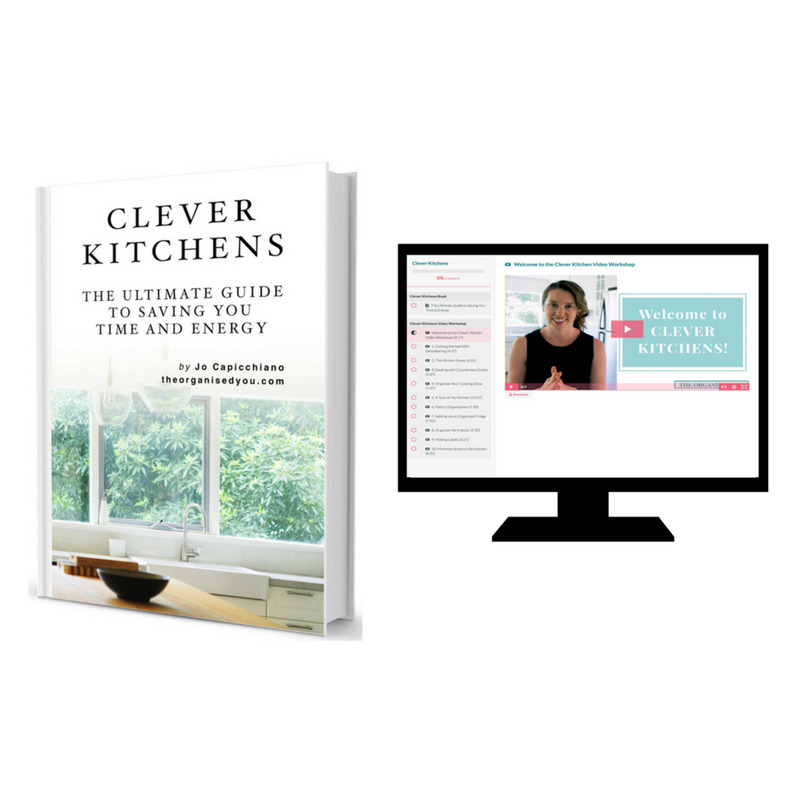 And consider setting up a command centre if you haven’t already - it truly is a life-changer! Filling out a school form but don’t have your child’s medical details handy? Not sure which date the school concert is on? Can’t remember what date you paid your last electricity bill, and how much it was? Forgotten your password for accessing your online banking? Easy reference systems can prevent all of these frustrating situations from ever occurring. Basically, a reference system is something that you can quickly and easily refer to, that contains important information that you need regular access to. A common mistake is having that information buried in a filing cabinet, in desk drawers or in boxes that make it difficult to dig through and find. The solution? 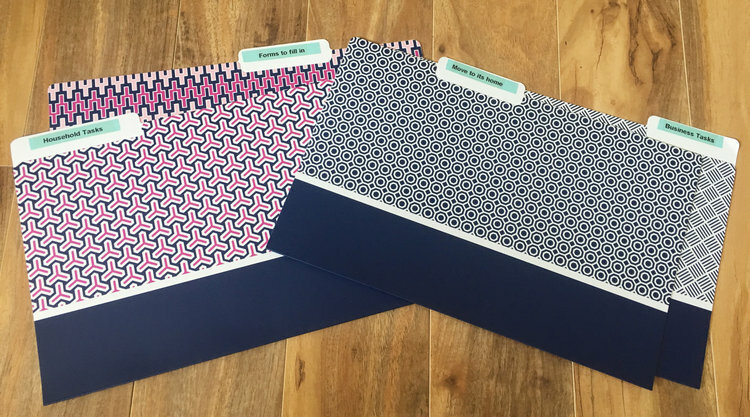 The first step is setting up a household binder - you can see how I set mine up in this post, and there’s even some free printables! I reference this folder all the time (especially the kids’ section), and having it stored within our command centre means I’ve got quick and easy access to it. If you’re on a roll, a finance binder is your next best bet - tracking your bills, debt repayment and savings means you can hold onto less paper and feel more on top of your finances in general. If you can identify with some, or even ALL of these paperwork mistakes, then worry not my friend, I’ve totally got you covered! 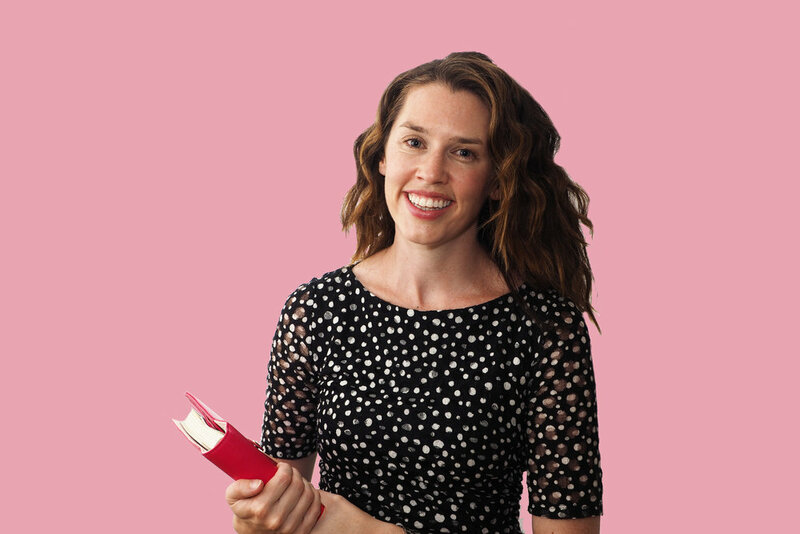 My guided online program 'Making Your Paper Work' is designed to help you sort through that pesky paperwork once and for all!